That's that only thought I have after watching Alex Gibney's powerful documentary on that fateful foul ball in the eighth inning of Game 6 of the 2003 National League Championship Series. With only five outs standing between the seemingly cursed Chicago Cubs and the World Series, super fan Steve Bartman accidentally stopped Moisés Alou from closing his glove over the ball hit by Luis Castillo of the Florida Marlins. The Cubs went on to lose not only that game, but then the rest of the series. - The Cubs had been up 3-0 before the fan interference, but let go of eight runs in the next half inning. - There was still another game after this one to be played, which the Cubs promptly lost. 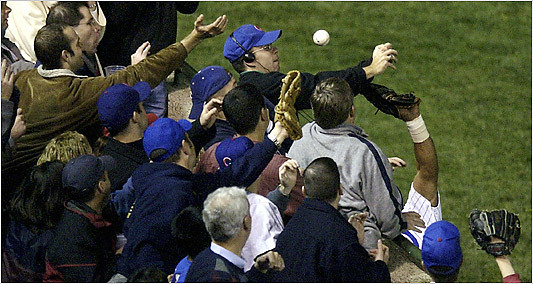 - At least a half a dozen other people besides Bartman reached for the ball at the same time. - The official rule book of professional baseball states that any fan interference means that batter is automatically called out. This did not happen. Gibney does a fantastic job of pointing all this out, though he doesn't let Bartman completely off the hook. He points out that Alou probably would have caught the ball otherwise. Also, previous video footage shows Bartman waving his arms wildly when the camera is swung towards him. As Gibney says in his voiceover, "be careful what you wish for." Yet and still, Bartman obviously got a raw deal. As someone who wears glasses and enjoys walking around with headphones strapped to my head (I can't sympathize with the turtleneck, though) it's an eerie reminder that it could just have easily been anyone, even me. I mean, think about it: if a foul ball is headed straight at you, you're going to be starting straight at it, not thinking, "well, for the good of the franchise, the city and the apparently fragile psyches of the thousands of fans around me, I should take a step back." You would have done the same thing. Even eight years after the incident it's still eerie to hear the shrieks of Cubs fans who were screaming for Bartman's blood after it was decided he would be the scapegoat. I'm convinced that the security guards, several of which were featured here, hadn't stepped in he would have been murdered right then and there. It was that serious. All this really points to one fact about sports: it's really just a reflection of our inner psyche. At its best sports can show how far we've come as a species. At its worst it shows how far we have to go. And if what Steve Bartman had to endure is any indication we have a long, long way to go.